It's time to bite this pill. Like the doctor says: "It's good for you!" Listening to the last effort Neil Young and his long standing colleagues Crazy Horse proffered, 'Americana', I was not in the mood for another one. I didn't get past the first three songs. And then friends started telling me that you better start listening. They even bought tickets to the Ziggo Dome show later this year! O.k, o.k, I put the album on my iPod and while biking from the city centre to the suburb I live, the same song was still playing. WTF? !, how long can a person drift back? Again I put Psychedelic pill away and was prodded again. 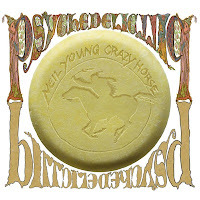 So I've bitten the pill, several times now, and can only state that Neil Young & Crazy Horse are in great form on this album. Having bought 'American stars and bars' in 1977, that makes it all in all a long time that I've followed Neil Young through ups and downs, country, grunge, electronics, rock and roll, rock, ballads and what not. When an artist is around for so long, competing with his older work becomes nearly impossible. There will never be another 'Like a hurricane', but a song like 'Ramada Inn' does compete with 'Cortez the killer'. On Psychedelic pill Neil Young lets his electric guitars hoot and howl like in the days of old. Long, dark, distorted guitar solos in lower and higher registers grace the album. Fans of the electric Young are not sold short here. Listening to the album does take some tenacity as the already mentioned 'Driftin' back' clocks at nearly half an hour. Two others do 15 minutes plus, the reason why this double album holds only eight songs. In 'Born in Ontario' Young looks back on his youth, before everything started for him circa 46 years ago, after moving to L.A. 'She's always dancing', only 8.30, is a melodically strong song, with a bit of a toss away lyric at first. The guitar playing and solos are a delight to listen to. There's always a new effect to try out and mix with others. 'For the love of man' is a rest point in the guitar noise. It's one of those songs that bring Neil Young's voice to the breaking point. There are a lot of people out there, ununderstandable but true, that can't stand his quivery voice. This song makes me understand why and still it's quite good, tacky but good. A bit out of place also, as the listener notices when the last power house of the album 'Walk like a giant' starts with guitars, whistles and all. Young starts exploring his fret board long and hard. 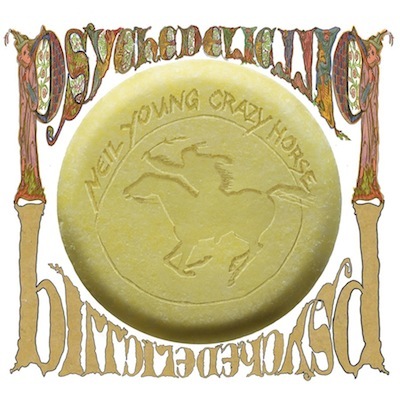 Taking Psychedelic pill in as a whole, it still takes some effort to get through 'Driftin' back', but once I'm past the first half our, I can only conclude that Neil Young & Crazy Horse have made a monumental album. Thanks for alerting and prodding me, guys!